This is the first installation of a much larger idea. A few years ago I had a crazy notion. 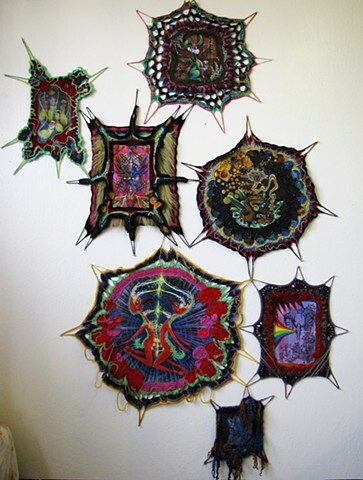 What if I make paintings with crochet amoeba like borders that can intertwine and create installations? This idea was going to take me awhile. Now, I am just starting to have enough of these paintings to see my vision in real life. Imagine 20 more paintings, of all sizes, stretching across a wall, onto the ceiling, and even the floor, covering a space like a creature. Each of my crochet paintings is like a cell in a much larger system, or a single thought of an idea. The paintings in a group like this talk to each other and create a whole larger than their parts.